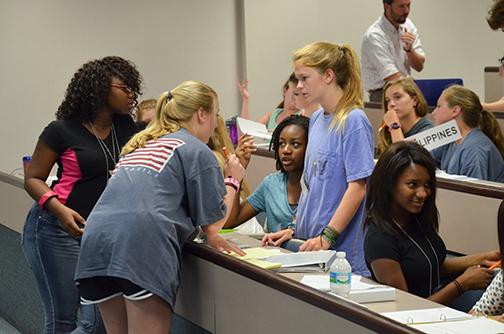 For a week in early July, the College of Education’s Secondary Social Science Education Program hosted 26 high school students from around the country in an outreach camp designed to help them understand international issues. Led by Jada Kohlmeier, Associate Professor in the Department of Curriculum and Teaching, the camp followed a Model UN format, but there were also classroom and research sessions where Kohlmeier’s pre-service teachers introduced the campers to the value conflicts that are inherent in international issues. The camp has a storied history, and is generally considered as the oldest educational outreach camp at Auburn University. This longstanding support from the Rotary Club has not gone unnoticed. The World Affairs Youth Seminar includes students from grades 9-12, and serves as an outreach effort for the College of Education. It is also a teaching lab for pre-service students in secondary social science education. Each camper is assigned a country which he or she will represent as a UN Ambassador. Auburn’s pre-service teachers present lessons on the various issues and guide the students in library research so they learn about their country’s positions on a variety of international issues and respond accordingly when the Model UN is in session. Karlie Burrell, a camper from San Antonio, Texas, represented Japan in this year’s Model UN.. As a result of her visit, the outstanding student now plans to come to Auburn for college. Both of her parents are Auburn grads. But Burrell realizes that in the Model UN, she must represent Japan’s positions, and not her own. Jade Johnson, from Florala, Alabama, has a dual enrollment in his high school and at Wallace Community College in Andalusia. He plans to join the Marines upon graduation from college. Developing qualities of leadership is also important to Johnson. The range of issues that come up when seeking solutions to pervasive world problems is almost endless. For example, when exploring ways to prevent corruption in regard to refugee camps, students debated whether body cameras should be required for facility guards. This led to the issue of financial inequity, since such a requirement would be especially difficult for poorer countries. Program graduate Drew Morgan, who serves the assembly as Secretary General, agreed that the seminar is excellent preparation for future teachers and scholars.